[PDF] The Steamy Kitchen Cookbook: 101 Asian Recipes Simple Enough for Tonight's Dinner | Free eBooks Download - EBOOKEE! Description: 0804843341 "I loved it and so did my girls! So easy, so quickâ€” soooo good. Thank you, Jaden, for your beautiful cookbook! I love it. "â€”Ree Drummond, author of The Pioneer Woman Cooks "What am I going to cook for dinner tonight?" It's a common lament for everyone, and the answer too often is something unhealthy, unappealing, or both in the form of expensive take-out. 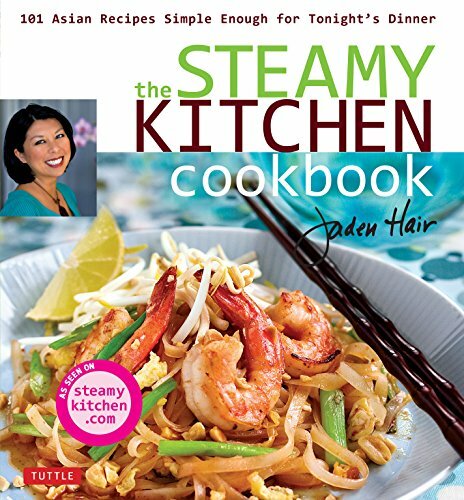 Jaden Hair comes to the rescue in The Steamy Kitchen Cookbook, a fantastic new cookbook stuffed with dozens upon dozens of foolproof Asian recipes that are quick and easy to doâ€”all in time for tonight's supper! Author and food blogger, Jaden Hair (steamykitchen.com) reveals her secret ingredient to create take-out favorite Broccoli Beef, shows you step-by-step in photos how to roll perfect Vietnamese Spring Rolls, how to make Thai Curry in less time than it takes to drive to a restaurant and teaches how, with only three main ingredients, you can fry up the crowd-favorite Firecracker Shrimp. With her irresistible sense of humor and accessible style, Jaden will have you running into your kitchen to start cooking! No comments for "[PDF] The Steamy Kitchen Cookbook: 101 Asian Recipes Simple Enough for Tonight's Dinner".